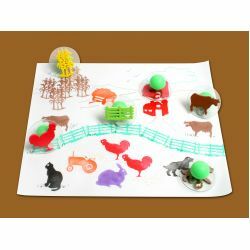 Have fun stamping out stories and learning about farms with this wonderful set of 3" foam stamps. The large knob handle is perfect for a child's grasp and the high density foam is easy to clean. There is a label on the clear surface that makes alignment easy, and the set comes in a plastic case that is reusable. The stamps work great with our paint and ink pads, too. 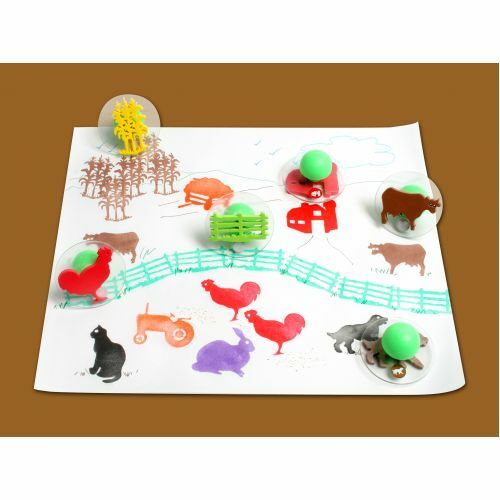 This 10-pack includes a hay wagon, a dog, a rooster, a cat, a cow, a corn stalk, a fence, a barn, a tractor, and a rabbit.